Accurate location services find its use in many public operations such as emergency services, vehicle tracking, stolen assets tracking, advertising, and social networking. For many years, Satellite based GPS (Global Positioning System) has been one of the most popular positioning method. The assisted GPS (A-GPS) was then introduced within the mobile devices that use cellular services to track devices by its Cell ID (CID) - the serving cell of a specific user. However, these methods presented limitations in their own way to track devices that were mobile, and were unavailable on remote terrains. This resulted in development of hybrid-position systems that uses a combination of different technologies (such as Cell Global Identity - CGI, Timing Advance - TA, Time of Arrival - TOA, E-OTD - Enhanced Observed Time Difference, and Assisted GPS - AGPS) to accurately determine the co-ordinates of a device that is mobile. The Location Services (LCS) architecture defined the process of mapping the received coordinates, expressed in latitude and longitude in a well-defined universal format, to the geographical area and sending this information back to the requested services. The LCS architecture distributes positioning functionality across different network elements and defines a network element as the positioning node. It specifies all the necessary network elements and entities, their functionalities, interfaces, necessary for positioning in a cellular network. LCS architecture follows a client/server model with the positioning node acting as the server providing information to external LCS clients. 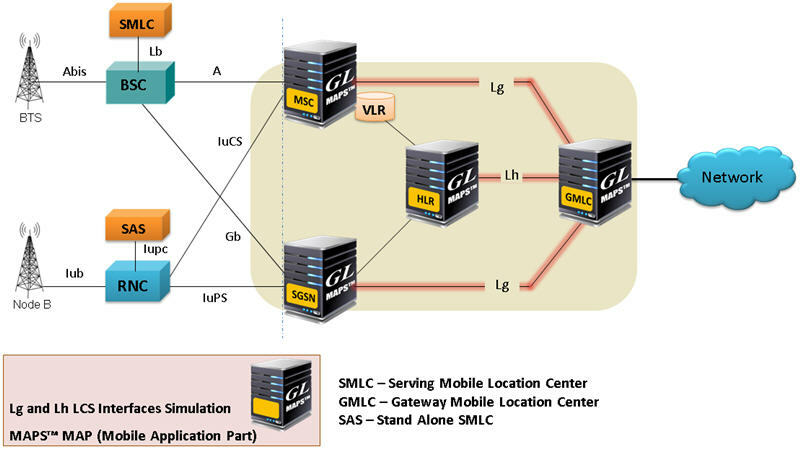 In the GSM, UMTS LCS architecture, GMLC (Gateway Mobile Location Centre) is the positioning node and centre point of the architecture that holds the position information by communicating with other network elements within the network. All LCS clients communicates with this node to request positioning information. Additionally, the GSM network includes separate nodes, Service Mobile Location Centre (SMLC) that resides within BSC and Location Measurements Units (LMU) that resides within BS, for calculating and updating the location measurements. 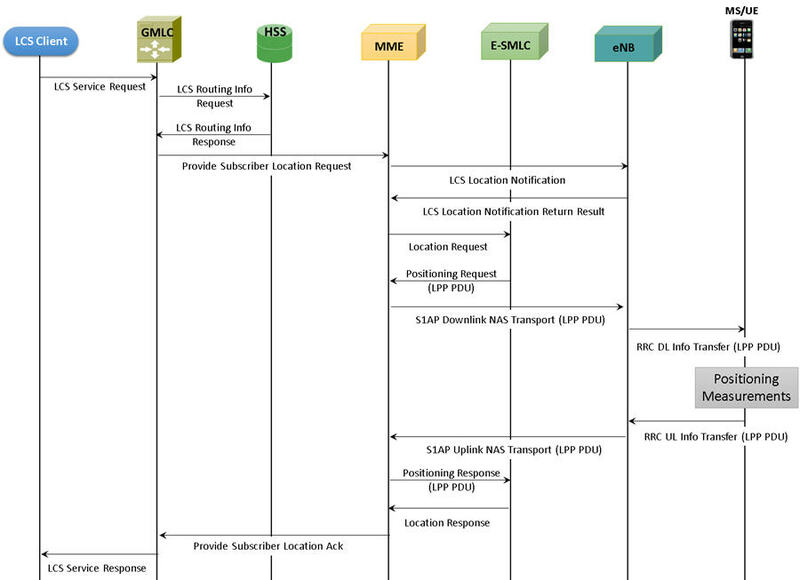 The control plane location service architecture for EPS introduced in 3GPP is illustrated in the figure above. GL’s MAPS™ LCS test suite comprises of multiple products working in tandem simulating end-to-end location-based services supporting above listed interfaces and positioning methods in GSM, UMTS, and LTE networks. Location or distances between two devices, can be estimated using different methodologies, some of them are listed which are based on classification of the positioning methods, which basically divides them between network based and handset based methods. Cell Global Identity (CGI): This positioning method gives the current cell location of the target MS based on the cell global identification or the Location Area Code (LAC) plus Cell Identity (CI). Timing Advance (TA): This is one of the known methods to calculate the location of MS where the time is calculated for the signal transfers from MS to the base station. Time of Arrival (TOA): In this method, the position of MS is calculated based on the signal sent from MS to the three LMUs (Location Measurement Unit), where the geographical co-ordinates in LMU is already known. Angle of Arrivals (AOA): In this method, the position calculation relies on smart BS antenna arrays required to measure the angle of the received signal. Time Difference of Arrivals (TDOA): In this method, the position of a mobile station is estimated by measuring the time difference of arrivals between the signal received at the serving BS and the same transmission received at other surrounding BSs. E-OTD: Enhanced Observed Time Difference (E-OTD) Positioning Method – MS-based E-OTD is the handset-based alternative to Uplink TDOA (U-TDOA). The E-OTD method needs at least three BTS’s where the logic is to calculate position with Observed Time Difference (OTD), Round Trip Delay (RTD), and Geometric Time Difference (GTD). Assisted GPS: AGPS provides the most accurate position of an entity which is approximately in 10 meters range. The position calculation is based on the radio signals sent by satellite to receiver (MS). 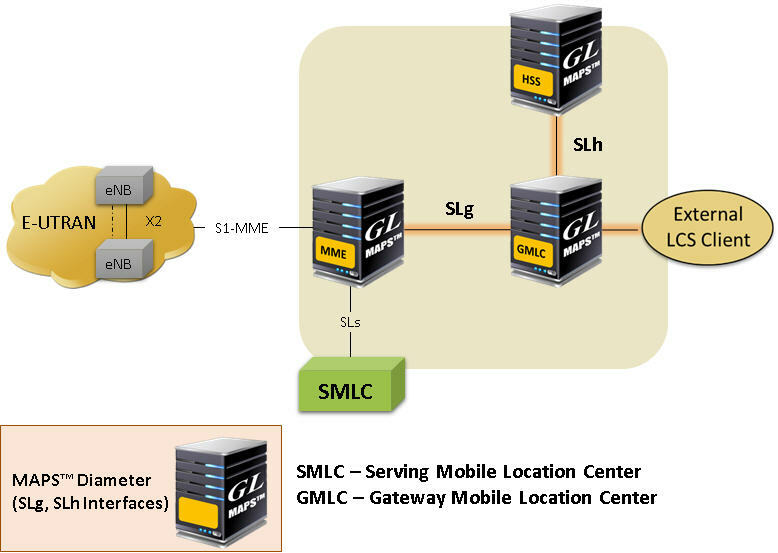 The LoCation Services (LCS) architecture follows a client/server model with the Gateway Mobile Location Centre (GMLC) acting as the server node providing information to external LCS Clients. All LCS clients communicate with this node to request positioning information. Additionally, the GSM network includes separate nodes, Service Mobile Location Centre (SMLC) that resides within BSC and Location Measurements Units (LMU) that resides within BS, for calculating and updating the location measurements. Location estimation uses different positioning methodologies that are classified into network based and handset based methods. The main difference is that the network-based measurements do their calculations at the infrastructure, while the handset measurements do their calculations at the handset. 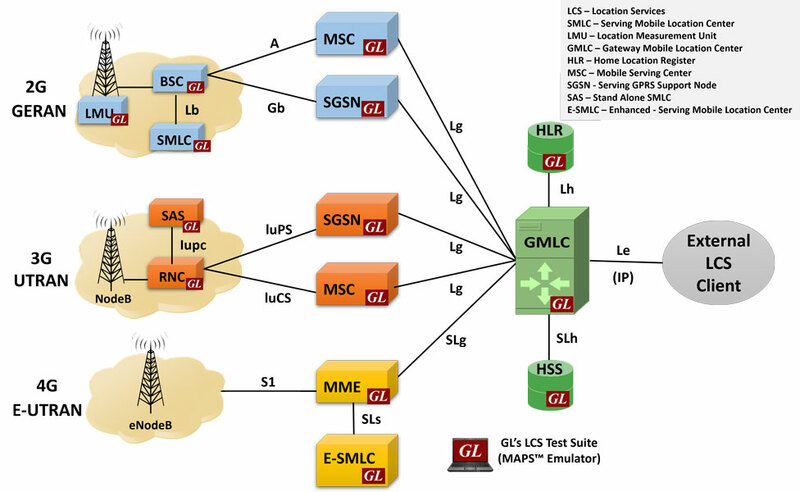 GL’s MAPS™ LCS test suite comprises of multiple products working in tandem to support simulation of end-to-end location based services in GSM, UMTS, and LTE networks. Specifically, to test location services in GSM network, GL’s MAPS™ MAP IP signalling emulator is enhanced to simulate LCS procedures over Lg and Lh interfaces using MAP signalling protocol. 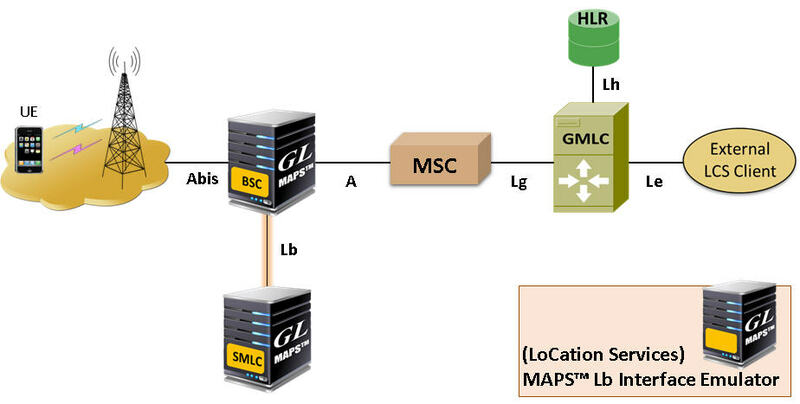 MS initiated Location Report Procedure is supported over Lg Interface between GMLC and MSC and network initiated Location Retrieval Procedure is supported over Lh Interface between GMLC and HLR. Further, the MAPS™ Lb interface emulator supports Location Service Request procedure over Lb interface between BSC and SMLC using BSSMAP-LE signalling protocol. These are discussed briefly below. Within MAPS™ the Location Estimate parameters such as Type of Shape and coordinates are input through conventional user profiles or are fetched from a CSV file every time it sends the location estimate to the client. This selection is to be made by the user in Profile configuration. If the selection is 'Profile' all the values present in the particular profile will be sent in the message response. If the selection is made as ‘CSV’, an entry from the csv file is loaded and all the values from the fetched record will be sent in the message response. These coordinates indicate different position of MS at different intervals of time and report is sent either periodically at specified time duration or at once when requested. MAPS™ MAP IP supports testing LCS functionality between SGSN/MSC and GMLC network elements within UMTS network. The Lg, Lh Interface enable LCS in the GPRS/UMTS to provide support for specialized mobile location services for operators, subscribers, and third party service providers. Both LCS server and LCS client simulation are supported Lg, Lh Interface. For more details on Lg, Lh interface simulation using MAPS™ MAP IP emulator, visit Lg, Lh Interfaces webpage. 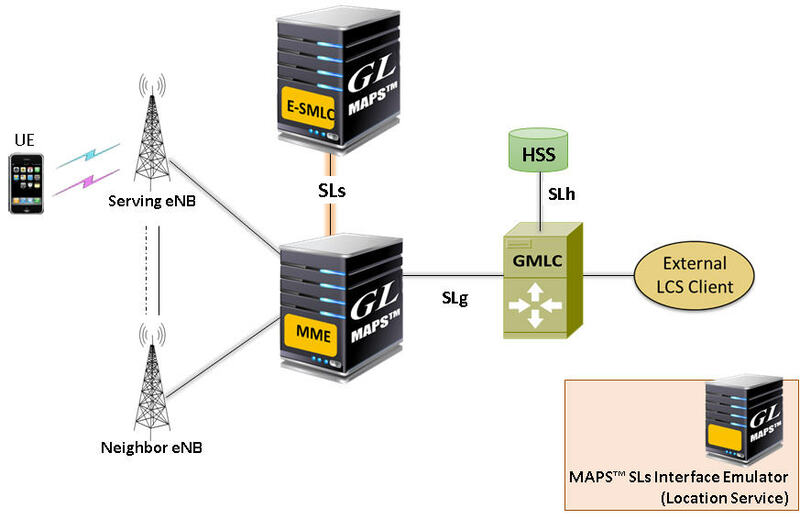 MAPS™ Lb interface emulator can simulate LCS positioning procedures over GSM Lb interface by simulating SMLC (Serving Mobile Location Center) and BSC (Base Station Center) network elements. 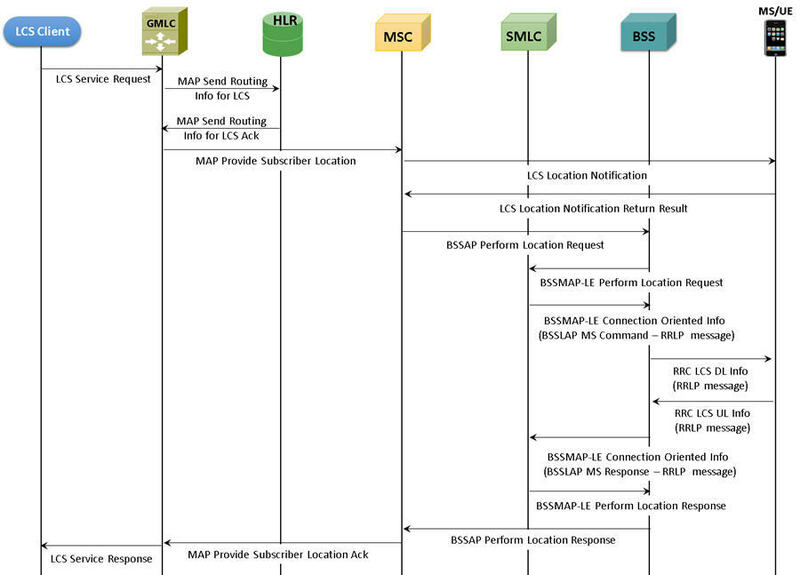 MAPS™ Lb supports BSSMAP-LE message exchange between BSS and SMLC as per 3GPP TS 49.031 specification. The Lb interface, is transparent to all UE related and LMU (Location Measurement Utility) related positioning procedures. For more details on GSM Lb interface simulation using MAPS™ Lb interface emulator, visit Lb Interface (GSM Network) webpage. Location estimation in UMTS network uses Positioning Calculation Application Part (PCAP) protocol over IuPC interface between RNC and the Standalone SMLC (SAS). PCAP consists of Elementary Procedures (EPs) initiating message and possibly a response message. Following are the functions of IuPC interface. Specifically, to support location services in UMTS network, GL’s MAPS™ MAP IP signalling emulator is enhanced to simulate Lg, and Lh interfaces using MAP protocol for estimating the position of mobile devices (mobile phones, wireless personnel, digital assistants and so on) independent of underlying network technology. Further, the MAPS™ IuPC interface emulator supports PCAP signaling procedure over UMTS IuPC interface between RNC and SAS. These are discussed briefly below. These co-ordinates indicate different position of MS at different intervals of time and report is sent either periodically at specified time duration or at once when requested. MAPS™ IuPC supports simulation of location service operation using PCAP (Positioning Calculation Application Part) protocol between the Radio Network Controller (RNC) and the Standalone SMLC (SAS) and the associated signaling procedures as per 3GPP TS 25.305 specification within UMTS network. MAPS™ IuPC Emulator simulates Positioning Calculation Service, SAS Centric Position Service, and Information Exchange Service PCAP functions. For more details on IuPC interface simulation using MAPS™ IuPC emulator, visit IuPC Interface webpage. LTE operates using two positioning protocols via the radio network: LTE Positioning Protocol (LPP) and LPP Annex (LPPa). LPP protocol supports hybrid positioning method, in which two or more position methods are used simultaneously to provide accurate measurements. The LTE Positioning Protocols (LPP and LPPa) are carried in LCS-AP PDUs over established SCTP session between an E-SMLC and MME. Location estimation uses hybrid positioning methodologies from the list of positioning methods given below. These positioning methods may be UE-based, network-based, UE-assisted, network-assisted and/or combination of these methods. The main difference is that the network-based measurements do their calculations at the infrastructure, while the UE based measurements do their calculations at the device. Specifically, to support location services in LTE network, GL’s MAPS™ Diameter signalling emulator is enhanced to simulate SLg, and SLh interfaces using Diameter protocol for estimating the position of mobile devices (mobile phones, wireless personnel, digital assistants and so on) independent of underlying network technology. Further, the MAPS™ SLs interface emulator supports Location Service Request procedure over LTE SLs interface between MME and E-SMLC using LCS-AP signalling protocol. These are discussed briefly below. 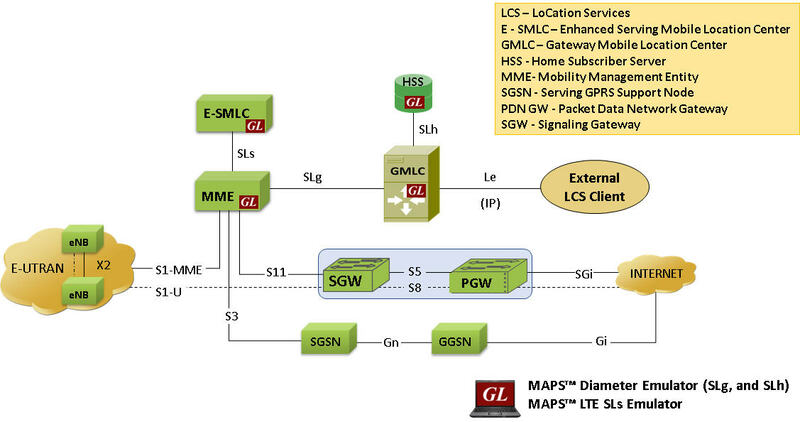 MAPS™ Diameter supports testing LCS functionality between MME and GMLC network elements within LTE network. For more details on SLg,and SLh interfaces simulation using MAPS™ Diameter emulator, visit SLg, SLh Interfaces webpage. MAPS™ SLs interface emulator testing LCS functionality between E-SMLC (Enhanced Serving Mobile Location Center) and MME (Mobile Management Entity) in the LTE network. LCS Application Protocol (LCS-AP) is a logical interface between the MME and the E-SMLC supporting the location services in E-UTRAN. The LTE Positioning Protocols (LPP and LPPa) can be carried in LCS-AP messages which are transparent to the MME. 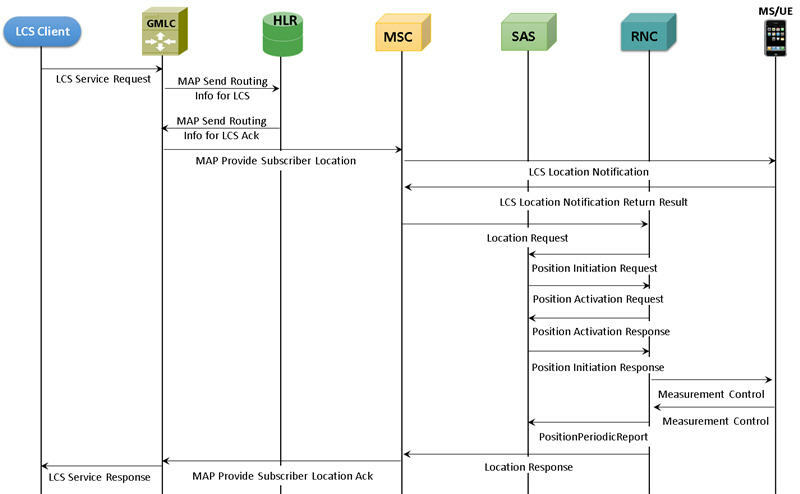 MAPS™ SLs supports LCS-AP procedures, which are divided as Location service request procedure, and Location information exchange procedure. For more details on LTE SLs interface simulation using MAPS™ SLs interface emulator, visit SLs Interface webpage.